Note: The following post is copied from the DEN Newsletter. Why do I love the DEN? Let me count 3 ways (all FREE!) and an DEN Trifecta first. Spring Into Action with the DEN during this unique (and free) professional development event where you have the flexibility to attend online or in-person at one of many regional events hosted by the DEN Leadership Councils. The day will feature a special presentation from Chris Lehmann, Principal of the Science Leadership Academy in the School District of Philadelphia as well as a great lineup of sessions from STAR Discovery Educators and the DEN team. Registration is open so check the blog for all the updates. Join us on April 24 at 8 PM EDT for the ribbon cutting ceremony for our new DEN headquarters in Second Life. Our new DEN headquarters is a virtual replica of Discovery’s World Headquarters in Silver Spring, MD – complete with the HD theater and the T-Rex. Put on your virtual dancing shoes and come celebrate with us! 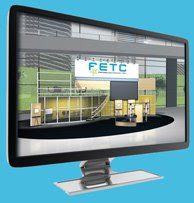 Before we Spring Into Action at the DEN Virtual Conference we will also be participating in FETC’s first online conference. Stop by our virtual booth on April 23 from 11 AM to 7 PM EDT. 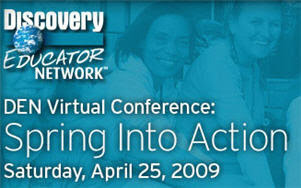 For more information check out http://virtual.fetc.org.